Looking for a profitable trading system that will automatically tell you when to buy, where to place your stop loss and where to take your profits? The Pro-Trading System does everything for you so anyone can trade the markets successfully. It is simple to follow and suitable for all levels of traders. Why Use The Pro-Trading System? Not only will you receive this fantastic trading system, but also an online video course from our state of the art learning hub. Get closer to your trading goals and let the Pro-Trading System do the hard work for you. 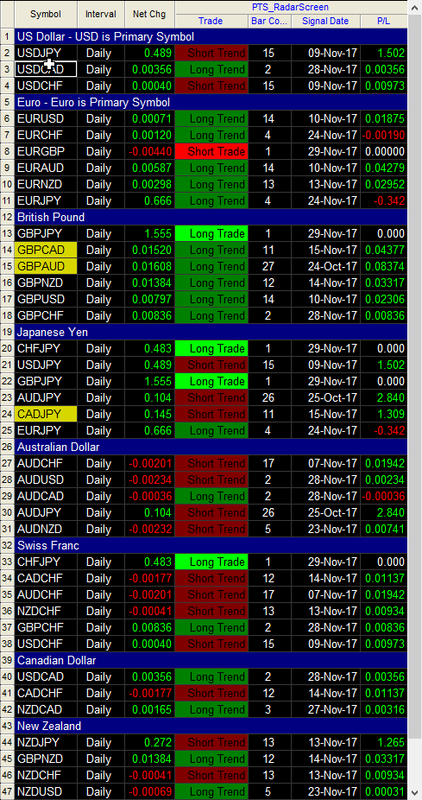 Look at the swing trading profits for all the forex markets in November – For example the USDJPY made 150 pips in 15 days, GBPCAD made a profit of 437 pips in 11 days and at £5 per point that be £2,185 profit for you. Also, the AUDJPY made a profit of 284 pips in 26 days and at £5 per point that would be £1,420 into your account. These are all trades that would bring in extra income while holding down a full time job. Or chat live to us below! Our signals software defines your entry price, stop loss order and profit targets so there is no need for guess work. I honestly feel for the first time in a while that I have a system and a set of rules in place to find consistency and ultimately make good money from trading the markets. Your teaching has been fantastic and I couldn’t have asked for a better introduction to both Trading College and the PTS. Thanks again for everything, I even wrote down the tips you kindly shared with Dad and myself. I look forward to future Trading College events and courses! ” Out of all the tools available in today’s society, I have found the Pro-Trading System (PTS) to have been the most sophisticated software available. The state of art technology is superb. Just by using the Storyteller alone is well worth the investment, not to mention the fact that the PTS is yours for life. They say “To be successful, one must study from those who are successful in the field you want to succeed in.” This is the fastest way to succeed. From my own personal experience Lee Sandford and his excellent team have exceeded and gone beyond my expectations. I have found Trading College to be a great investment in my future and would urge everyone who is sitting on the fence to get the PTS, have the faith and believe that you too can be successful.